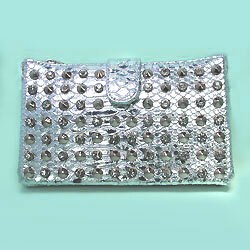 Silver snake evening bag clutch purse with gold studs and clear rhinestones in gold settings. Includes a silver snake detachable strap, zipper closure and zippered pocket on back both with gold zipper pulls. The inside has three separate compartments and a zippered pocket on the back. This purse works well for both evening events and daytime wear. 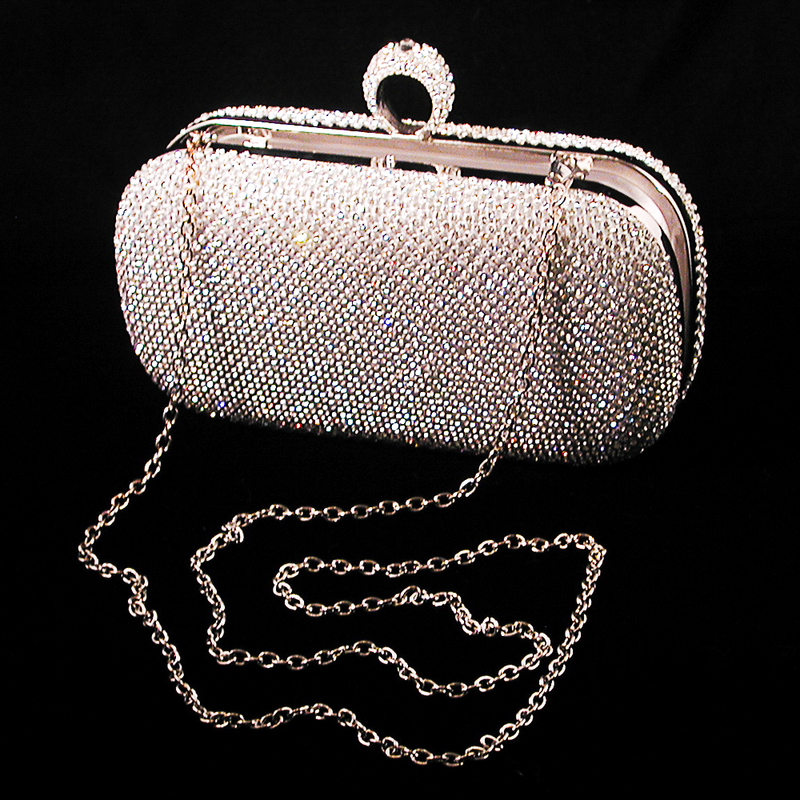 Its a great purse with lots of bling. 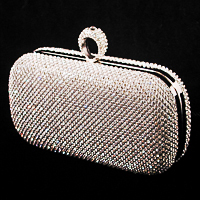 Measurements: width 7-3/4", height 5", depth 1"
Satin evening bag clutch bag purse in a dramatic pleated starburst design with a crystal rhinestone ornament in the center of the flap. This evening purse includes a matching shoulder cord with 22 inch drop. It is lined in satin and has a snap closure. 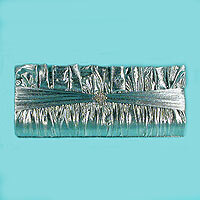 This purse is sensational as a prom clutch, or for weddings and special events. 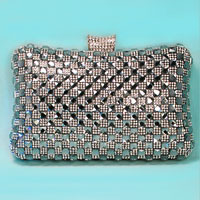 Measurements: width 9", height 3-3/4", depth 2"
Metal mesh evening purse with zipper closure. Includes a matching metal shoulder chain with a 23 inch drop. Measurements: width 11", height 6", depth 1½"
Color: silver. Hue: silver. color code: #C8C8C8. Type: silver. 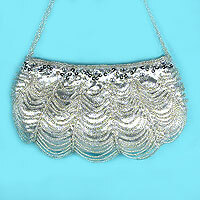 Satin evening bag with looped beaded design and beaded handle. 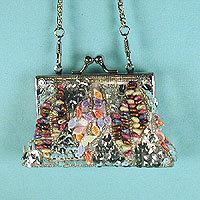 This lovely purse has a vintage art deco look with loops of bead in five columns on each side. The top is trimmed with seed beads and rhinestones. The handle is 14 inches long, 3/8 inches wide and consists of braided seed beads. It has a center snap closure and is lined in satin with a small pocket on one side. Although small and compact, is easily accommodates a cell phone. 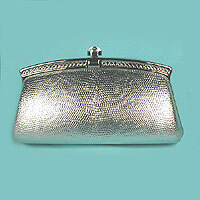 Measurements: width 8", height 4", depth 1"
Small silver lame evening bag. 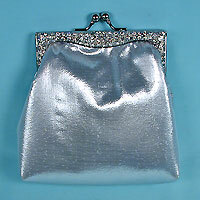 This is a lovely little bag with a wave design metal frame trimmed with pave small and medium round rhinestones. It has a kissing lock clasp and a retractable shoulder chain with a 22-inch drop. The interior is lined in white satin. 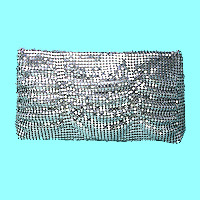 Measurements: width 5", height 5", depth 2"
Tiny coin purse size evening bag fashioned with sequins and beads. Includes retractable metal chain handle and shoulder chain. It closes with a kissing ball snap. 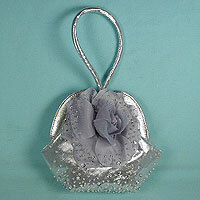 This miniature evening bag can be used a coin purse or worn as an amulet. It is beautifully embellished with various size beads and sequins and lined in satin. It a unique substitute for a long pendant. 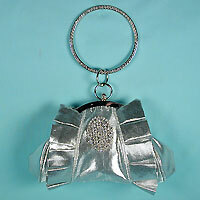 Measurements: width 4½", height 3", depth 1½"
Brushed metal purse with a rhinestone trim across the top. Measurements: width 8", height 5", depth 2½"